As a Public Relations Professional, I am still in awe at the way the Royal Family slayed the PR game around the royal wedding and effortlessly catapulted The Monarchy into the future. The royal PR team and organizers dazzled the world with the incredible amount of symbolism on display. Without saying a word or making any “announcements” their message was received loud and clear around the world. Not via people’s ears but via people’s hearts. LOCATION: Windsor Castle. Choosing the oldest inhabited castle in the entire world as the timeless symbol of the British Monarchy, sent a message that the Monarchy is here to stay and expects to last another thousand years. THE GUEST LIST: The guest list was very diverse, featuring different races, ethnicities and from all walks of life. The wedding was both a warm family gathering as well as a national holiday. It felt authentic and real as the world was invited to celebrate along with the happy couple. The Guest List was made up of people from charities, war veterans and survivors of tragedies, among others. It was a huge statement of inclusion and diversity, flying straight in the face of rulers around the world currently encouraging racial strife and ethnic divisions in their own countries. 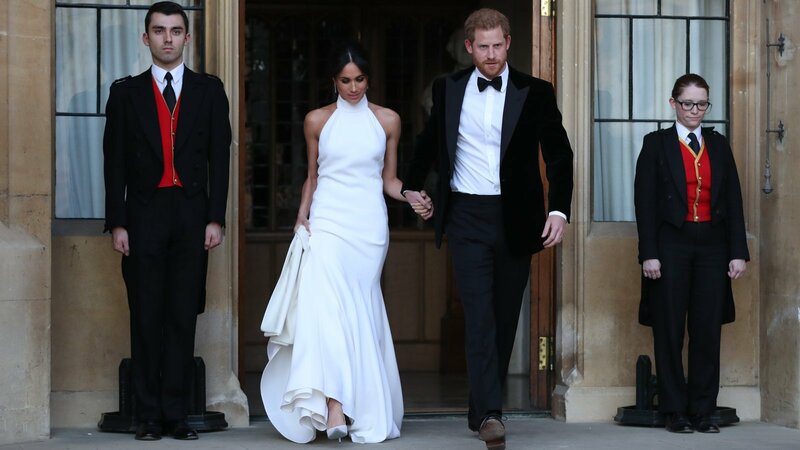 THE DRESS: While many were expecting beading, sequins, rhinestones and ruffles, Meghan Markle’s simple Givenchy dress was also in keeping with the general message of the entire wedding: “Simplicity and Authenticity.” Many did not notice that her veil was embroidered with images of native flowers from all 53 British Commonwealth countries, a symbol that Britain is still a force of influence around the world and the importance of the Commonwealth to the Monarchy. THE BRIDESMAIDS: There was no bevy of gorgeous society women trailing the bride. Only children, representing Simplicity, Innocence and the Future. The young couple and group of children told the world that a new generation of Royals is coming into its own and they are unapologetic and unabashed about leading the world into the 21stCentury. Enough said. THE SERVICE: Oh, My God! Here was an Africa-American preacher going all out on the redemptive power of Love! A gospel choir singing “Stand By Me” and amazingly talented cello player who happens to be black. It all seemed unreal and wholly improbable but there it was. And we all knew a new Era had dawned in the world. SOCIAL MEDIA: As always, thousands of traditional media outlets descended on the town of Windsor to cover the wedding from start to finish. One difference was diverse media outlets run by young people who were covering the event for millions of youth. And the Social Media play was strong! @KensingtonPalace Twitter account was tweeting all kinds of detailed information about every aspect of the wedding, bringing people around the world right into the action. In addition @TheRoyalFamily’s Twitter account was also in the thick of the social media action. Talk about making the Royals accessible! Congratulations to all who worked to organize this masterful event which went off without a hitch. A great lesson in the power of Symbolism. Gabriel Reyes is President & Founder of Reyes Entertainment, a communications company specializing the Hispanic and Mult-Ethnic markets.